Back in March, it was revealed that 18 staff at HS2 Ltd earned more than the £142,000 salary of Prime Minister David Cameron, with a total of 26 earning more than £100,000. Whilst Mr Cameron has had a pay rise since then taking his wages to just under £150,000, this is nothing compared to what has happened at HS2 Ltd, where 46 staff now earn more than he does, with 71 earning more than £100,000. The information was revealed by Parliamentary Under-Secretary for Transport Robert Goodwill MP in answering a written question from Chesham and Amersham MP Cheryl Gillan. The answer revealed that the total salary costs at HS2 Ltd are £37m for 626 staff, putting the average wage at the quango at £58,809, over double the £27,600 average UK wage. Chief Executive Simon Kirby, who joined HS2 just after receiving a £300,000 loyalty bonus from Network Rail remains the highest paid UK civil servant on £750,000. Managing Director of Infrastructure, Jim Crawford takes home £393,000, whilst Chairman Sir David Higgins makes £242,400 for a three-day week. 5 members of staff on Grade 25 average £246,165, 18 on Grade 23 average £184,660, and another 20 on Grade 22 average £162,836. 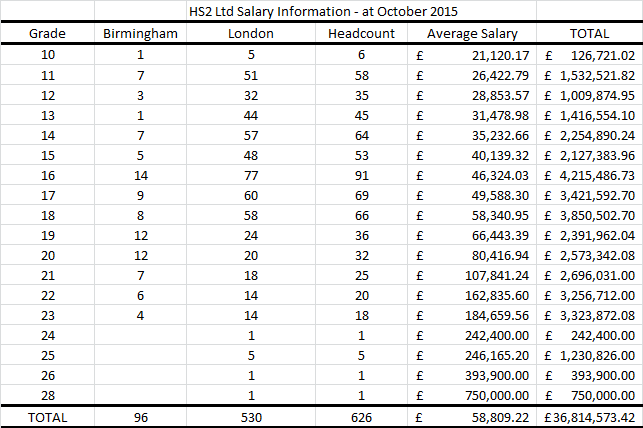 The written answer also showed that only 96 people, 15% of HS2 Ltd staff, are based in Birmingham. This is despite the fact HS2 Ltd signed a deal for 100,000sqft of office space in the city in July last year. With rents likely to be £28-30 per sqft, the premises should by now have cost at least £3.5m in rental over 15 months, which works out as over £36,000 per desk. Ed Balls statement puts Labour commitment to HS2 under threat. Pingback: STOP HS2 | HS2 Ltd display a complete inability to do simple maths. Pingback: STOP HS2 | Osborne boots HS2 links to Manchester, Leeds & East Midlands into long grass. So you receive a loyalty payment from a company and then move on. I hope the award is revoked/repaid. In the past the payments were intended to reward past performance but incentivise future performance and tie you to the company for a further 3 years. Pingback: STOP HS2 | HS2 Cost Jumps by £13.1bn. What are these 626 people doing when hs2 has not been approved by parliament?